It seemed hard to believe that the lifts at Mount Washington were still running on Father’s Day – in June – at the end of the 2009/2010 ski season. With another 200cm having fallen on the slopes in recent days, it looks like Mount Washington is primed for a repeat of last year’s Snowmageddon. The mountain is ready to welcome skiers and snowboarders over the next two months and have created a number of events, activities fun promotions from now until the end of the season. The incredible conditions will ensure that this weekend’s Sprite Big Air Comp at the Stomping Ground Terrain Park will go off without a hitch. With more snowfall and colder than average temperatures looming in the forecast, it looks like you’ve just found the perfect reason to play hooky. 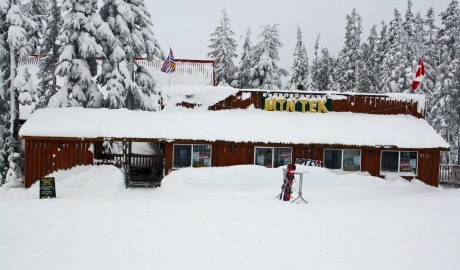 For more information on Mount Washington Alpine Resort – including directions and accommodations – visit the resort online. You can also find Mount Washington on Facebook or follow their updates on Twitter.